I purchased an 07 e63 with 96k miles about 6 months ago. 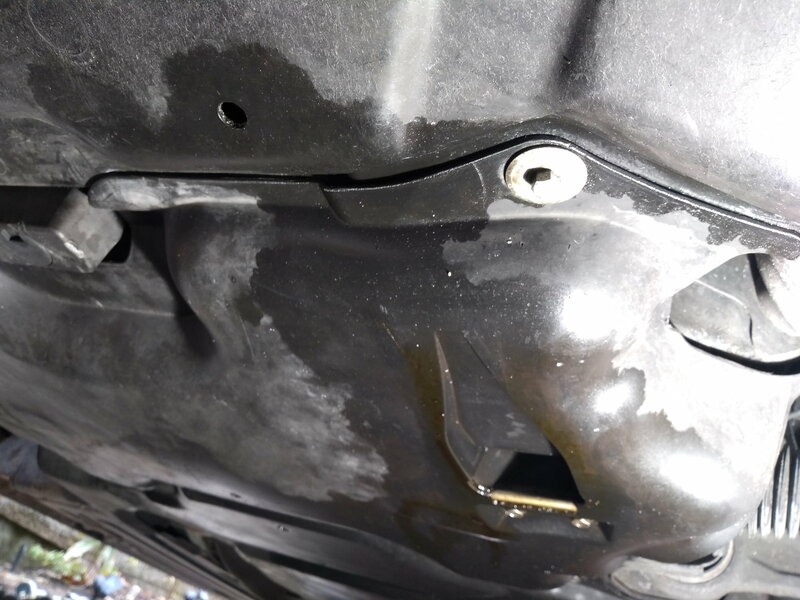 Noticed an oil leak coming from drivers side. It hasn't affected the oil level, but I don't want it to cause other problems. Any area's I should look first or common problems with this car/miles? It's not coming from filter housing, oil pan or drain plug. Upper part of engine block is clean and dry. Also, doesn't appear to be getting on drive belts either. After removing lower plastics, seems to come from lower area of motor on drivers side. Any help would be great. Here are some pics. Also, forgot to mention that my driveway is on a hill. So it sits down hill when parked. Valve & breather covers, oil seprators, oil pan? Start looking up the block until you see the highest point you can see oil and that's probably the source or close to it since liquid flows down hill. 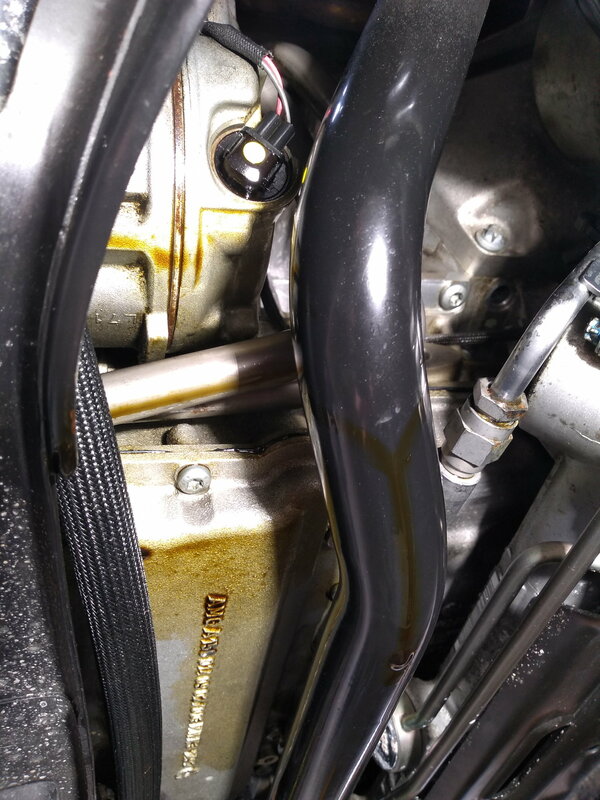 Are you sure its engine oil and not the hydraulic fluid from a bad motor mount? Engine mount fluid is orange. It's not orange in color, it is pretty dark so I'm thinking oil. Are there 2 drain plugs on the E63, like the C55? 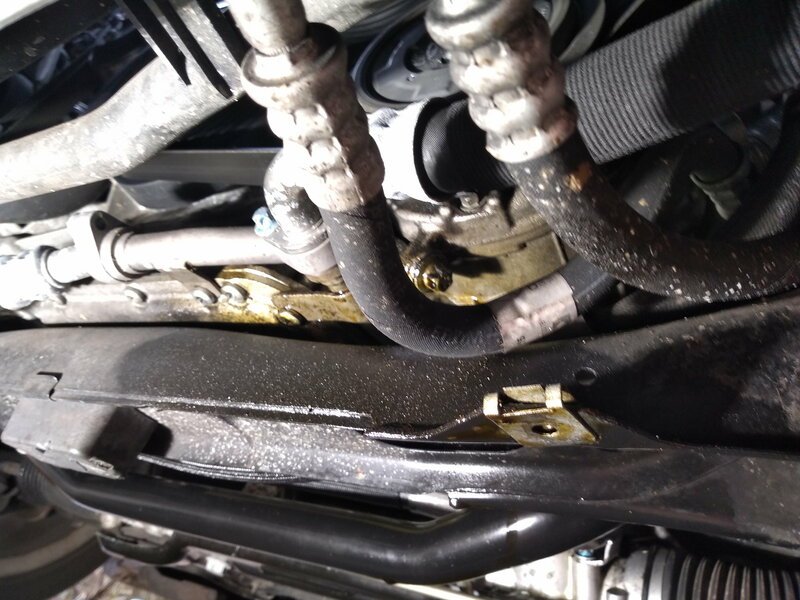 It's not leaking from the oil pan or the drain plug. Valve covers are notorious for leaking, I'm in the middle of doing mine right now at 95k on my E320 with m112. A lot of people had had issues with anything but OEM Mercedes branded valve cover gaskets leaking after being replaced. Before I knew this I went with Elring from fcp euro as they are suppose to be the company that makes them for Mercedes. 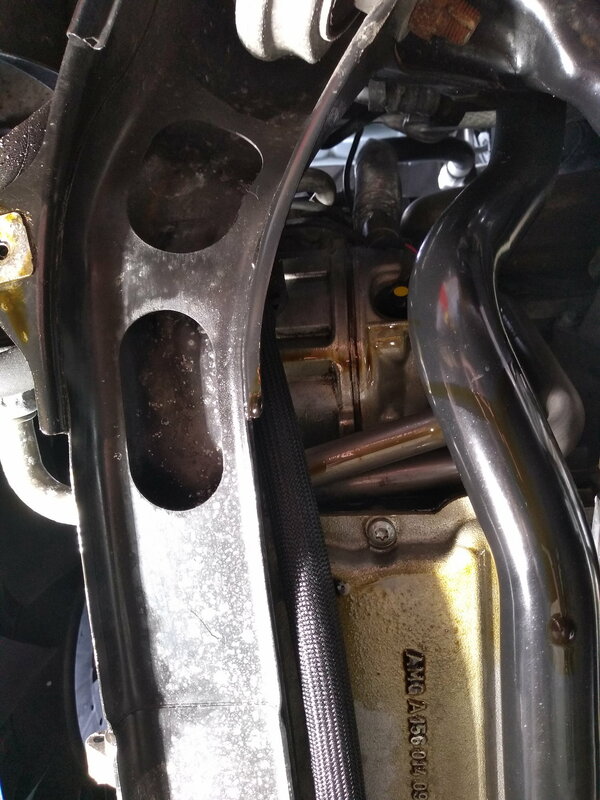 If it is the valve cover gaskets you'll also want to replace the breather tubes as they get hard and crack causing a leak and additional mess. On my engine I have breather covers that don't have a gaskets but use sealer and they also leak like a sieve to. After doing this I think there are a few things that cause the covers to leak. 1) the covers have a groove that is textured the valve cover gasket back spine sits in, from looking at my valve cover I can see old brown oil in the groove telling me the texture allows oil to get past the back of the gasket while it's pressed in to the groove. - To fix this is used three bond 1211, a silicond based motorcycle case sealer I've used in the past that works great and is impervious to oil and high heat once cured. 2) the valve covers are not torqued down very tightly, 79 inch lbs (6.5 ft lbs) so all of the sealing is done by the gasket face being pressed on to the machined surface of the top of the head. - to fix this I put thread locker on the threads to make the bolts don't back off with heat cycles. ​​​​​​3) I believe the valve covers are magnesum and I believe they have a tendency to warp with heat cycles which ads the the bolts backing off and the sealing surfaces not holding the little amount of pressure 6.5 ft provides. Solution was thread locker and checking torque after a couple of heat cycles. We'll see if these things work as I'm waiting for the 1211 to cure before I fully torque the valve covers down and finish the job. Last edited by Cambz; 02-14-2019 at 10:33 PM. Thanks for all the info Cambz. Recently had a flat tire so took car to a local shop and decided to pay for oil leak diagnosis. Was told it is the oil temperature regulator/oil cooler thermostat. They said the engine has to come out, timing cover removed, etc. just to get to this part ($2800 quote). I've called a few European repair shops in STL and none of them seem to understand what I'm talking about when I ask for an estimate to fix this leak. I'm using the same terminology as the auto shop. So, guess I've got a lot of research to do.